Umar Akmal is most popular Pakistani cricketer. He is moreover popular for different scnadals. Few months ago he had to face scandal of traffic warden & now he has been disqualify for playing cricket. According to PCB Umar Akmal has been catched in an valgur party. 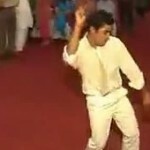 Even you can watch umar akmal dance video.